Life is too short to spend it at war with your own heart. 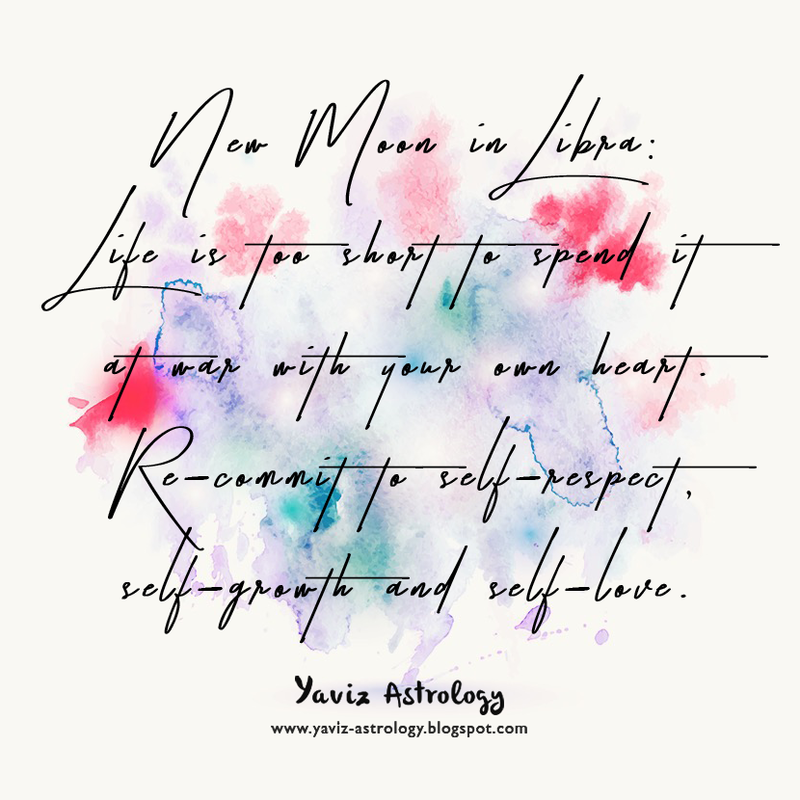 Re-commit to self-respect, self-growth and self-love. It's about time we returned home to our hearts. It's about time we asked ourselves whether or not we have been deceiving ourselves with our own false conclusions about love. There is a secret place within that is often forgotten. A place where there is no judgments or expectations. A place where acceptance and forgiveness reign. This place is called unconditional love. Love, in essence, can take many forms. But the conditional forms can often get in our way of truly experiencing unconditional love. Unconditional love, or a love without conditions, in its pure form can empower us to embody our most loving self. It's not the kind of love that we often hear in romantic songs, or that we often say when we're expressing our interest in something or someone. One of the best ways to spot the difference between conditional and unconditional forms of love is to see if the ego takes part in it. Our ego can limit the room in which unconditional love expresses its truest form, because it contains expectations. Expecting another person to love us in the exact same way when they aren't able to is not love, but emotional blackmail. This doesn't mean that we should let ourselves feel like a victim of love. This simply means that we are being asked to look at what truly lies beneath the surface. Before we can love anyone unconditionally, we must first love ourselves. We have to give and express to ourselves the love that may have been missing in our lives. Only then will we be able to recognize unconditional love - which is a spirit of the whole human experience, and from there, gain a deeper connection with the universe. its truest form, because it contains expectations. Happy New Moon! The Moon is joining Jupiter and the Sun in Libra, marking a super expansive and diplomatic New Moon in the sign of the Scales. The time is ripe for planting new seeds of love and learning. Relationships and their dynamics can come to the forefront now for us to ponder. Wherever there was imbalance, we can start to find new meaning and a way to bring back a sense of balance. Life offers relationships that are challenging and ones that are nourishing. If we are not content with where we are at the moment, remember that all experiences have their place. There is much to be learned and we will learn if we remain open and objective. Can we find a way to achieve fairness right now? This is a time for listening and speaking. A time for understanding, as well as asking to be understood. Let our hearts connect to others, and make space for a balanced exchange of ideas and actions. remember that all experiences have their place. The Libra Moon is forming a sextile to Saturn in Sagittarius, and we are reminded that we reap what we sow. We may observe an injustice righted and fairly redressed. But first, we are being asked to listen to the calling of our hearts. We will be amazed by the sense of empowerment that emerges within as we stand up for ourselves and others. Bring back balance in our relationships by sending out love, rather than hate. One thing is for certain, if fairness is our intention, then the imbalances will be resolved for the highest good of all. With the Moon's square to Mars and Pluto in Capricorn, we may feel pushed beyond our comfort zone, especially if we believe that we have too much to do or not enough time. But Mars and Pluto in Capricorn is asking us to use discernment and assertively set boundaries in choosing to work on a project that's calling to us. Our long-term loyalty to our goals is also becoming more evident in our lives. If we remain loyal to our dreams and faithful to our plans while staying flexible, we will be shown proof of our true devotion. We can make great progress with our commitment to focus and do the work that we are guided to do. work on a project that's calling to us. The Moon is also forming an opposition to Uranus Rx in Aries, and let's be new, think new and open our hearts to new things. It may be time to look at outdated beliefs, old ideas and misplaced trusts. Right now we have an opportunity for important healing, but we need to reflect on the stories we tell ourselves about love, connection, fear, envy and the perception of victimhood. Are we comparing ourselves to others, thinking that their success should be ours? Are we back where we started, or in a situation that reminds us of past mishaps? Perhaps we are sabotaging ourselves, because deep down we're afraid of all the good that is coming our way? Not only do we need to begin a new story, we also need to forgive ourselves for telling ourselves those old ones. The New Moon in Libra is guiding us to have new compassion for parts of us that believe in negative self-narratives. To let new energy enters old relationships so that we can renew our connections from a more heart-centered place. To end our heartache by rewriting a new story within us where we are not victims, but warriors of love. It's time to see love, not as a source for drama, but as our greatest teacher. soul, going from one level of awareness to the next. The past no longer works. What used to work in our lives is no longer working now. Who we were yesterday can no longer fit within who we are today and what we're currently going through. This is no longer a matter of changing ourselves for the sake of change, but because of what's being asked of us. We are being asked to reinvent ourselves. To stretch ourselves beyond our old limitations. To release negative beliefs about ourselves that feel like truth, but actually not. To embody our truest selves in order to fulfill our highest aspirations and reach our full potential. Where there was obscurity, now there is clarity. Where there were lies, now there is truth. What can we see now that we couldn't see before? What are we ready to let go so that we can become more truthful to ourselves? Being honest with ourselves is the way to personal growth and true liberation of the soul. Being true to ourselves brings inner peace through conquering the conflicts we carry within our own minds. When we are feeling stuck between the past and the future, one of the first steps to take is to look at how honest we have been to ourselves. The confidence that comes from acknowledging what is true is the key to release our suffering from clinging to the past. This doesn't mean that we should erase the past, but more to see the past as a time when personal growth and development took place. A time when we learned more about ourselves and the world around us. A time when we discovered our truth and inner freedom. As we become more honest with ourselves, we discover a truth that goes beyond what we see or what we feel, and that's where our true power resides. the key to release our suffering from clinging to the past. Happy Full Moon Lunar Eclipse! The Moon is joining Neptune Rx and Chiron Rx in Pisces forming an opposition to Mercury Rx and the Sun in Virgo, marking an extra instinctive and imaginative Full Moon in the sign of the Fish. With a Lunar Eclipse happening at the same time, we get a chance to finally let go of something that is holding us back from moving forward. The act of letting go may be something that we get to do time and time again in life, but during a Lunar Eclipse period, forces out of our control can drive us to release from ourselves illusions of disempowerment and embrace our personal power. Typically, power has been viewed in a negative light due to the negative ways in which power and influence have been exercised. But there is a clear distinction between positive power, which comes in the form of personal power, and negative power. Personal power is based on the strength and confidence one gradually acquires from personal growth and evolution. This type of power symbolizes a movement toward self-realization and spiritual awakening. Its primary goal is control and mastery of self, not others - which is the primary goal of negative power. The Moon's conjunction to Neptune Rx and Chiron Rx is reminding us of the deep healing power of forgiveness of self and others. It's about time we cleaned out old stuck anger, blame or resentment we may have been holding on. Even if what another person did is unforgivable, it's time to stop harboring their essence so that we can clear our energy and lift our spirits. Always remember that we are a divine conduit of love and healing. Through forgiveness, we open a doorway to spiritual mastery and hence able to help others cope through the same life lessons with our own spiritual centeredness. clear our energy and lift our spirits. With the Moon's square to Saturn and Mars in Sagittarius, some parts of our lives need re-balancing. Perhaps we have been working too much or postponing our priorities to exercise, eat healthily, meditate or create. Rather than feeling overburdened, try to bring an element of fun back into our lives. This is not to neglect our duties or responsibilities, but to find a way to feel less overwhelmed by not being so serious all the time. Dedicate some time to balance by doing something we really enjoy or creating something which is meaningful to us. Let go of the tendency to think worst-case scenarios by opening our mind to new, unseen possibilities. Changes happening now are divinely orchestrated to remind us of life's bigger reason and purpose. Ask ourselves, "Are these delays reminding me about the true meaning of patience? ", "Is this problem teaching me the true power of being emotionally resilient?". enjoy or creating something which is meaningful to us. The Moon is also forming a sextile to Pluto Rx in Capricorn, bringing to us the courage to renew the way we express our emotions, unleashing a new power within us. This points to a time in the cycle of human life when things need stirring up in order for true, revolutionary change to take place. The strength of the forces of change will be in alignment with our emotional growth. And we will find that chaos is an integral part of that much-needed change. Not all chaos are bad. Without chaos, there would be no order. By taking a closer look at what is within a chaos, we start to recognize familiar patterns and begin to rebuild our personal structures. Chaos can also provide a way to see from multiple perspectives. Everything that doesn't work is taken from us so that the truest parts of ourselves remain. 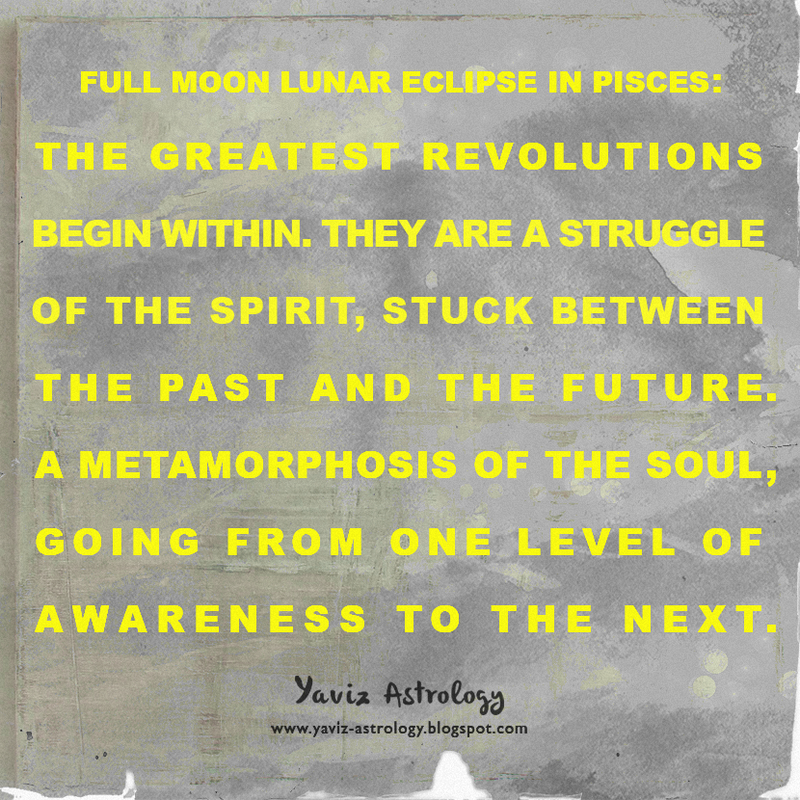 The Pisces Full Moon Lunar Eclipse is a time to recognize that even in the seeming chaos, there is divine order. Don't be afraid to jump into the mix. Be present in the eye of the chaos. Everything that's happening now is in truth shaking things up so that we can find the real path to our true destiny.